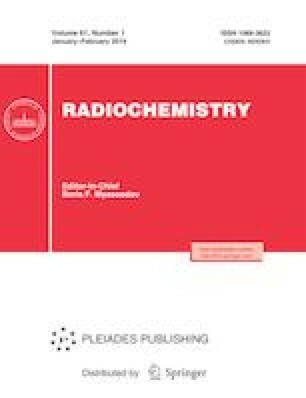 The motion of 221Fr and 213Bi in Actinide Resin, Dowex 50×8, and AMP-PAN sorbents in the course of continuous separation of these radionuclides from the parent 225Ac adsorbed on Actinide Resin was studied with the aim of obtaining chromatographic data for the development of a 225Ac/213Bi generator based on separation and decay of the intermediate 221Fr. A model describing the concentration of the daughter radionuclides as a function of the elution time and position in the volume of the chromatographic system was suggested. The distribution coefficients k′ of Fr and Bi on the above sorbents were determined experimentally. National Nuclear Data Center, Brookhaven National Laboratory, USA, https://doi.org/www.nndc.bnl.gov/nudat2/. Charged particle cross-section database for medical radioisotope production; diagnostic radioisotopes and monitor reactions: coordinated research project, IAEA-TECDOC-1211, Vienna: IAEA, 2001, ch. 4, https://doi.org/www-nds.iaea.org/medical.